Herrick Bridge -River Road, Lindley,N.Y. - 1972 Flood The program for the October 2012 L/P Historical Society Meeting will be Thursday October 25, 2012 7 P.M. at theLindley Town Hall U.S. Rt.15. The 1992 WETM Video "And the Rain Kept Falling" narrated by the late Carl Proper and others will be shown. The film marked the 20th Anniversary of the June 1972 Flood that resulted from Hurricaine Agnes. ** A little known fact is after General Taylor's first wife died, he married Mary (Miller) Lindsley -widow of Col. Eleazer Lindsley who had died in 1794. Col.Lindsley was the founder of the present Town of Lindley,N.Y. in1790. In the deeds in the Steuben County Clerk's Office, are records showing that in 1805 -General Taylor purchased some of the Lindsley property-including the lot where Col.Lindsley has built the first mill in this area in 1790. 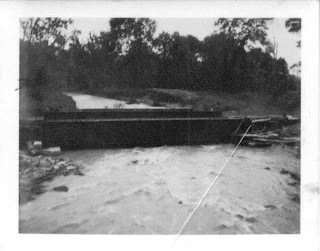 This, also, included a sawmill in the same area on what is now Watson Creek in Lindley. It is interesting how a question about local history can become an interesting research project. In response to query about the date that the Harrison Hotel located near the Lawrenceville RR Depot burned, I began checking the Newspaper Archives of the Green Library in Wellsboro, Penna which are on- line. Previously, I have discovered that these old newspapers have a wealth of information about the Lindley,NY/Lawrenceville,PA area. 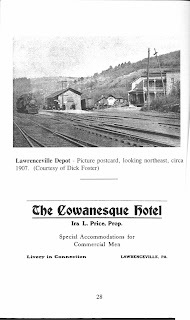 Not only am I finding a story about the Cowanesque/Harrison/ Park Hotel, but many other interesting facts and stories. I have chosen this one because it describes how busy the Depot area was on June 24,1896 -- courtesy of the Wellsboro Agitator.